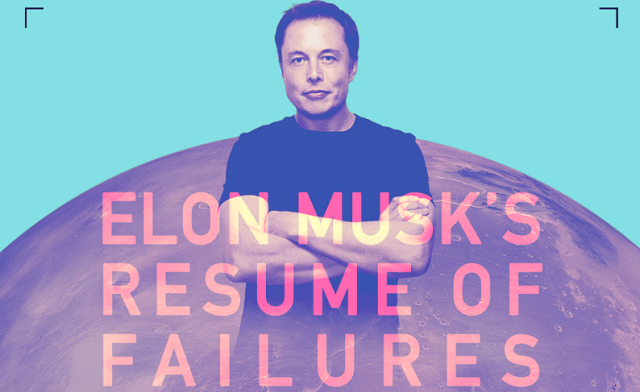 Elon Musk's Resume of Failures #infographic ~ Visualistan '+g+"
Failure is frustrating. Failure is something you don’t put on your resume. On the contrary! One does not simply write a resume of his or her failures. At the same time, if you attempt great things, your failures are probably going to be just as impressive as your accomplishments. There’s probably no other person alive today who embodies this notion more than Elon Musk. Sure, he’s considered a genius who also happens to be worth $14 billion. Certainly, many of his ideas have turned into realities. Arguably, he revolutionised every industry he has ever touched: eCommerce (PayPal), automotive industry (Tesla), space flights (SpaceX), and sustainable energy (SolarCity). Still, all of these accomplishments pale in comparison to his ability to fail.